The video clips are coded with DivX 4.02 (if no remark) and have (almost) TV quality. Audio files use mp3-compression. Have fun with this multimedia site! Guess why this bird is called "wipebird"! Two sounds will stay in your mind as they are very typical for Australia: music made with the didgeridoo and the voice of the laughing kookaburra! This beautiful and powerful little bird is a flesh eater and feeds on insects, frogs or snakes. Sure you have seen pictures of this cute animal. And I am also sure you would never assign those noises to a Koala! Koalas are really hard to spot in the wild. They use to sit in high trees and hardly move. Often it's easier to find them with your ears than using your eyes... At Magnetic Island there is good access to the Koalas and you can get very close! The Slender Billed Corella seems to be a very busy bird. At Halls Gap (Grampians) thousands of this parrots keep the sound level up in the evening hours. This site shows pictures of the white rumped swiftlet and plays an audio file. These birds use the clicking noises for their orientation inside caves. That's similar to the radar system of bats. Kangaroos & Emus (5,9MB) Even there are a lot more kangaroos than Australians living in Australia it can be difficult to spot any. It's good to know: Kangaroos like hanging around golf courses or campgrounds. At Geehi, a big campground at Snowy Mountains National Park you will see many of them! Platypus (4,7MB) If you like to see the Platypus very close you should spend a night or two at the Broken River Mountain Retreat at Eungella National Park. Get to the viewing platform at dawn or at dusk and stay quiet! The Eungella National Park is one of the nicest in Australia and has a lot more to offer! Carpet Python (3,1MB) The Carpet Python is a very slow moving harmless snake. Fruit Bats - smelly and very noisy during daytime. These bats feed on the juice of fruits (like mangos). Thousands of them fly from Hervey Bay to Fraser Island each evening. Koalas (13,1MB) Koalas at the Forts Walk, Magnetic Island. Rainbow lorikeets (7,1MB) South Mole Island (Whitsunday Islands): hundrets of the noisy Rainbow lorikeets wait to be fed each afternoon - spectacular! Keas (9,2MB) The Kea is the only parrot living in the snow. If you like to see the intelligent Keas in the wild go to Arthurs Pass, to the Fox- or Franz Josef Glacier, or meet them on your drive to Milford Sound. Take care of your car - they like all the rubber in and outside! Kickboxing (8,8MB) Kangaroos at Halls Gap (Grampians - about three hours drive west of Melbourne). 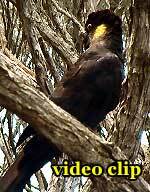 The Slender Billed Corellas are responsible for the audio track of this clip.